There was a lot of talk in financial media last week about the seventh birthday of the current bull market and if we may be approaching the end of it this year or next. While I was glad to hear people acknowledge that we are in a bull market, I don’t so much agree with the age and certainly not the proposed longevity of it. While you can call March 2009 a bottom and start the meter running from there, I think that gives too much credit to the early years when the economy was still struggling and then discounts the later years. For instance, S&P 500 operating earnings didn’t regain pre-crisis (2006) levels until 2011. Also, we were still having negative nonfarm payroll prints through September 2010 when we lost 52,000 jobs. Looking at the chart of the S&P 500 below, we didn’t really start a sustained upward move until 2012, which would be a more fitting starting point since the turbulence of late 2011 is excluded. All that being said, I find it tough to associate 2009-10 with a period like 2013-14 when companies had much stronger earnings and the economy was creating jobs. Saying this bull market is seven years old seems to make it easier for people to say it’s about to end. For me, a bull market encompasses not only rising stock prices but also a positive economic backdrop. 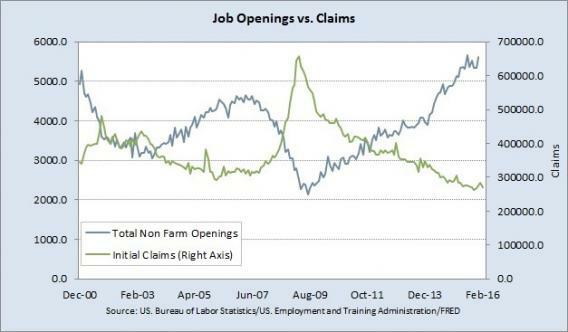 The point here is that the labor market is strong and still has room to tighten. Hence, consumption is set up to be strong. As a result of a strong labor market, and not to mention cheap gas, we’ve gotten some great news on the retail front. On Wednesday, Darden Restaurants (DRI) raised its third-quarter earnings estimates because of stronger-than-anticipated sales. The DRI news really ties in well with the data on increased gasoline demand and record driving amounts that we have gotten recently. Literally, people are going out to eat more often. On the global macro front, we’ve gotten some very encouraging news over the last few weeks. It pretty much all starts with oil and then finishes with the ECB seeming to have finally come up with the correct combination of QE tools to get things going in Europe. In the last month, oil has gone from roughly $26 to just over $38 a barrel, which has allowed U.S. and emerging markets as represented by the iShares MSCI Emerging Markets ETF (EEM) to rally along with it. Reasons abound for the rally in oil, but I suspect that the producers, namely Saudi Arabia, looked into the abyss that $26 oil was bringing and didn’t like what they saw. Along with oil, there has also been a nice rally in the metals complex ranging from iron ore to copper. This has taken pressure off emerging markets and then, by default, the U.S. Even though the rallies are mostly being driven by an expected reduction in supply and not increases in demand, whatever gets the global deflationary death spiral off the table works. As for Europe, it’s still very early to tell how all the policy tweaks announced by the ECB on Thursday will work out, but markets have reacted positively so far. Having read various sell-side reports and other private investor opinions, it seems the ECB’s shift to focus on credit growth vs. negative rates is the right approach. The reaction to the ECB so far in F/X could become a major tailwind for U.S. companies doing business in Europe. Since the announcement, the euro has rallied significantly vs. the U.S. dollar. If this trend holds up, we can hopefully eliminate the strong dollar roadblock to better corporate sales and earnings. Coming up this week, we have several major data points along with the Fed meeting. The only thing really missing from the lineup is nonfarm payrolls. As for the Fed, I’m not expecting it to raise rates. Given the turbulence we just got over and the near-zero expectations in the fed funds market, it will hold for now. However, I would expect some hawkish language given the strength in labor and recent inflation readings. As for the economic data, there are several interesting items. Retail sales on Tuesday could show a large gain. The only issue here is if the extra volatility we had in February somehow spills over into the sampling data. Considering the company reports I have listed in this article and the others we’ve gotten, we should get a strong print. That said, if we don’t get a strong number now, I would expect next month’s to be that much better, assuming we don’t go back down the oil rabbit hole. Then we have industrial production (IP) and the Philly Fed Manufacturing Survey, which go somewhat hand in hand. IP was up nicely in its last report and Philly Fed came in less negative. If manufacturing is showing some reversion to the mean, then maybe we get some reasonably OK prints here. Again, I don’t expect much out of manufacturing in general. On Thursday we get the JOLT survey, which measures job openings and quit rates. This is one of Janet Yellen’s favorite indicators about the health of the labor market. The last report had openings near an all-time high, and it would be great to see them go up again. However, it would be discouraging if the rise is from a lack of skilled workers. What we would really like to see in the report is an increase in the quits rate, which is indicative of workers’ confidence in moving between jobs for what we hope are better opportunities. It’s going to be an action-packed week for sure, but all in all, I’d say this bull market has plenty of room to run and the legs to do it.